When you hover over a build record or build definition, a window is displayed that contains information about the build artifact. If a build record contains available build verification test (BVT) information, click Show More to see the BVT information and build definitions that are associated with the record. When you compare two artifacts or two versions of the same artifact, differences between values in the Summary section are now highlighted. The values include the artifact's built-in attributes, category values, and custom attributes. In the Summary section, use the Accept action to accept the values from the source artifact. When you work in a project that is enabled for configuration management, you should use a global configuration, which contains the configurations of contributed streams from various applications. If Rational Quality Manager is in a local configuration, there is no way to resolve requirements links from Rational DOORS Next Generation without knowing the configuration of the Rational DOORS Next Generation stream. If you are working in a local configuration, a warning message is displayed to use a global configuration. The warning is displayed in the hover content of requirements links in the editor sections and the related information sections. An application-level warning is also displayed at the top of the page. For more information, see New resources in Rational Quality Manager Reportable REST API. For more information, see fields in Rational Quality Manager Reportable REST API. You can define the priority values of a test artifact by using string literals. These values do not convey the literal meaning of priority. For example, to define a test suite's priority as high, you use this configuration file syntax: testsuite.priority="literal.priority.130". Previously, if you had user-defined priority values, you had to manually edit large sets of Excel data to map those values. Now, a new configuration file syntax is available that enables you to define priority values by using the optional #define syntax. User-defined priorities do not support user-defined priority values. Note: Undefined priority values are not translated and are not sent to the server. If a priority value matches a custom priority, the server processes it. Otherwise, the server assigns default values for the priority. For more information, see Rational Quality Manager Word/Excel Importer: Priority value mapping. You can now create related resource links of the type "References" from any file stored in Jazz source control to Rational Quality Manager test cases. Links are established through the Rational Team Concert Eclipse client. If a test case is related to any source-control-managed (SCM) files, that file link is visible in the new Related Files section in the artifact editor's right sidebar. In addition, a new Linked Files column is available in the test case table views. In this column, you can see the linked files for each artifact resource in those tables. When you export a test case table to a PDF or CSV file, the Linked Files column is included in the resulting document. The test case APIs were updated to include a new file element, which represents an SCM-linked file. These elements are included in the resource XML for these elements when the calmlinks=true parameter is used. When you create a link between artifacts in different applications that have project areas enabled for configuration management, the link is stored in one of the applications. A requirements link in Rational Quality Manager is stored in Rational Quality Manager, and not in Rational DOORS Next Generation, while a quality task link in Rational Quality Manager is stored in Rational Team Concert. During manual execution, users with the appropriate permissions can add, edit, and delete steps by using the row-level actions for each step. After the execution is complete, users can merge the changes back into the test script by using the Compare with Test Case Result Steps button in the Manual Steps section of the test script editor. Use this button to select the modified test case result and merge its modified steps back into the test script. The browse test script table has a new column named Step Merge Status that you can use to filter test scripts. By default, the step merge status of all test scripts is empty. If steps are modified, added, or deleted during execution, the step merge status changes to Pending. When you merge changes back into the test script, the step merge status changes to empty. You can also perform the Compare with Test Care Result Steps action from the browse test script table. In the browse test case result table, use the Compare with Test Script Steps > Keep Test Script Steps action to keep the current test script without merging with the modified result steps. This action marks the step modification status of the selected test case result as Merged. In the test script editor, you can remove the requirement link associated with a manual test script step by using the Remove action button that appears when you hover over the link. Similarly, in the test case execution and test case result editors, you can remove the defect link associated with a manual test script step by using the Remove action button that appears when you hover over the link. You can link Rational Quality Manager test cases with architecture elements of an OSLC architecture management (AM) provider such as Rhapsody Model Manager. To create these links, you must add an association between the Rational Quality Manager project area and the AM project area. The Rational Quality Manager action bar menu now includes an Architecture Elements menu, which is hidden by default. To display the menu, change the setting in the project area editor, under Menu Organization > Main Menu. You can use the Architecture Elements menu to create or view architecture elements. The test case editor now includes an Architecture Element Links section. You can add the section to a test case by using the Manage Sections dialog box. The Architecture Element Links section shows the architecture elements that are linked to the current test case. You can use this section to add, create, and remove architecture element links. The test case table view now includes a Validates Architecture Elements column. You can add this column by using the Change Column Display Settings dialog box. The Validates Architecture Elements column shows the architecture elements that are linked to test cases. You can add and remove architecture elements by using the inline cell editing menu. Shared saved queries are now integrated with process templates, which means that you can create new project areas based on a process template that contains saved queries. The saved queries might contain filters that reference artifacts that apply only to the project area in which they were created. By default, those types of saved queries are not created in the new project area. Delete imported queries with missing references: Queries that are imported from a process template might reference artifacts that do not exist in the new project area. Enable this option to delete these queries. You can select one or both preconditions. New precondition and post-condition sections were added to the Test Case Result editor. These sections display the content from precondition and post-condition sections of the associated test case at the time of execution. You can now resize the Run Test Case dialog box horizontally. The resized width is saved and used the next time that you reopen the dialog box. 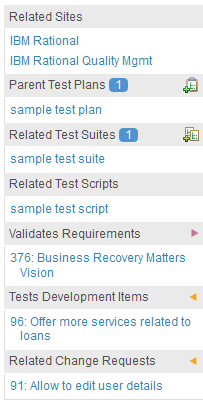 A new Test Items section was added to the Test Case Result editor. This section lists the work items that are related to test case results that do not affect or block the result, such as work items that are not defects. When a test case runs, the data that is passed to the adapter (the execution request) includes the test environment name, not the identifier of the test environment or the URI for the test environment. Because duplicate names are allowed for test environments, the adapter cannot determine which test environment to use. Now, a unique identifier is passed with the test environment name so the adapter can determine which test environment to use. This unique ID field is visible in the Execution Variables section of a test case result. You can now automatically delete test case execution records (TCERs), test suite execution records (TSERs), and their previous execution results when the execution record references a plan and a test case or test suite, but the plan no longer references the test case or suite. TCERs and TSERs are deleted as part of a scheduled background task which occurs once a day by default. 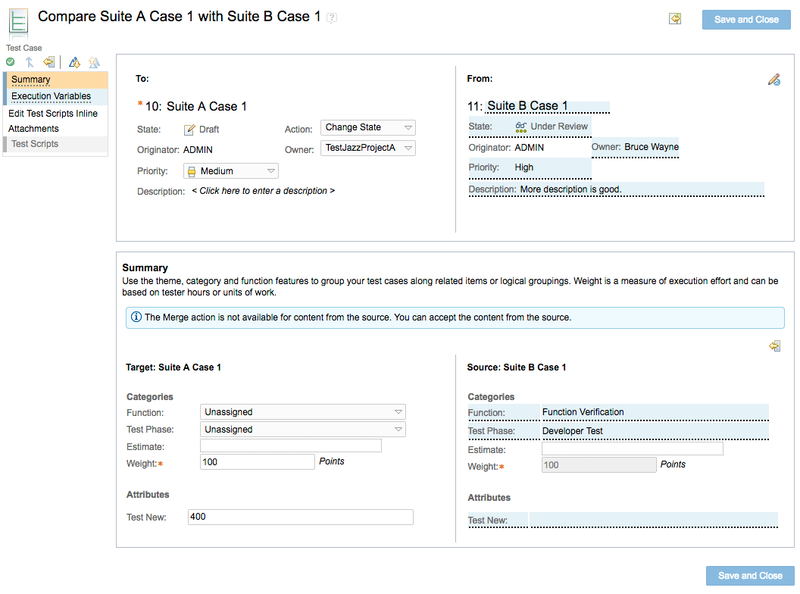 To modify the schedule frequency, go to Advanced Properties and change the "Case and Suite Unreferenced by Plan Clean Up Task Fixed Delay" setting. Previously, you had to manually update the Time Spent field of a test case execution record after it ran. Now, a new preference named Calculate time spent of a test case execution record once its execution is over was added under Manage Project Properties > Execution Record Preferences. If you enable this preference, the Time Spent field of the test case execution record is automatically updated after it completes the current execution by subtracting the end time from the start time of the last result. By default, the weight distribution of a test case result depends on the verdict of its step results. Consider an example where the weight of a test case result is 100 and it has four step results. Three step results are passed, one step result fails, and the overall actual result of the test case result fails. The passed point of the test case result is 75 and failed point is 25. A new project property named Calculate weight of a test case result based on actual result was added under Test Result Preferences. If you enable this preference, the weight distribution of the test case result is based on the actual result and not on the verdict of the step result. Because the actual result failed in the example, the failed point of the test case result is 100 and the passed point is 0. The execution tool has two new arguments: -testCellName and -testCellItemId. When you run a test case execution record (TCER) or test suite execution record (TSER), you can provide the test cell by using either of these arguments. -testCellItemId=<testCellItemId>: Item ID of the test cell from which adapters are selected during the execution of a TCER or TSER. -testCellName=<testCellName>: Name of the test cell from which adapters are selected during the execution of a TCER or TSER. This argument is ignored if the -testCellItemId argument is provided. Test suite or test case ID: -testCaseId=32 (-testSuiteId=123) Note: The testSuiteId or testCaseId argument is required if the TSER or TCER ID is not specified. Test plan ID: -testPlanId=21 (To search an execution record within a test plan). Test environment: -testEnvironment=Android (To search an execution record that runs on a specified test environment). Current iteration: -currentIteration=true (To limit the search to the current iteration only). Last created execution record: -runLastCreatedER=true (To select the most recently created execution record if multiple execution records are associated with a test case or suite). You can provide at least one -testCaseId or -testSuiteId argument and as many as all five arguments to identify a TCER or TSER to run. Note: These additional arguments are required only when a TCER or TSER ID is not specified. When you run a manual test, you can add a defect at the step level. During test execution, you can now delete a defect from the current or a previously executed step and add it to another executed step. Previously, a gap existed for reporting on test case results or test suite results based on builds. This gap surfaced when you reran test case execution records (TCERs) against a specific build, and then ran the same TCERs against a different build. You have 10 TCERs. You run the 10 TCERs against build A. 3 of the 10 TCERs fail, so you run them against build A again. After this run, you have 13 test case results and 10 of the results are marked as Current. The next day, you run the same 10 TCERs against build B. You cannot report on the current results for build A, because the new results from build B are marked as Current. To address this issue, a new Current for Build column was added. Previously, the current results were available for only a TCER. Now, you can apply a Current for Build flag to show the current results for a TCER and build record combination. For each TCER and build record combination, only one test case result can have the Current for Build flag set to true. Similarly, for each test suite execution record (TSER) and build record combination, only one test suite result can have the Current for Build flag set to true. The Current for Build column is available in both the Browse Test Case Result and Test Suite Result List views. The column supports filtering, sorting, and grouping. Now, to report on a specific build, you can create a shared query where Build=<build record name> and Current for Build = true. You can use this query in dashboard widgets such as Test Statistics, Test Matrix, and so on. The Current for Build flag for existing test case and test suite results will be updated by the asynchronous migration task. To check the status of the "Current for build flag on Test Case Results Migrator" and "Current for build flag on Test Suite Results Migrator" tasks, go to https://<server>:<port>/qm/migration. You can add a test case execution record and a test suite execution record to an execution schedule by using the Add Step operation. Column filters are now available for all columns in the Add Step dialog box for both test case execution records and test suite execution records. Previously, during test case execution, the precondition and post-condition sections of a test case were collapsed by default and only displayed the title and section description. Now, the two sections are expanded by default and their contents are displayed. The section description is in context-sensitive help, which is displayed when you hover over the help icon. New project properties were added under Execution Record Preferences to prevent test environments from being edited if test case execution records and test suite execution records were previously run. The new preferences are Do not allow changes to the test environment if a test case execution record was previously run and Do not allow changes to the test environment if a test suite execution record was previously run. Test suite steps: Even if the test suite is updated with a new or modified step, the rerun operation takes the suite steps from the previous test suite result, not from the test suite. 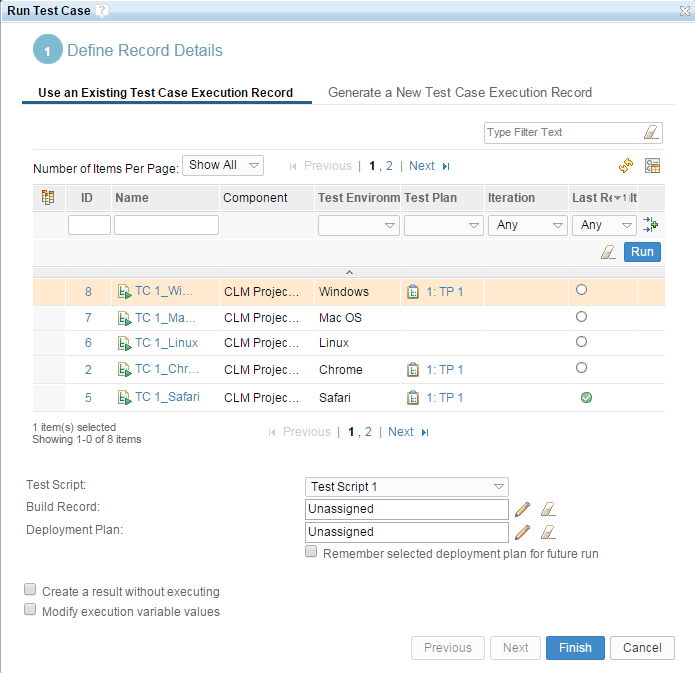 Previously, to run a test case execution record (TCER) from the list view, you clicked the row actions menu icon; then, from the drop-down menu, you clicked Run Test. Then, from another drop-down menu, you clicked Run to start the execution. The same multiple clicks were also required to resume a paused execution. This release includes a simpler way to start the execution. When you hover over an entry in the TCER list view, if the Last Result column is displayed (default), the Run icon is displayed beside the last result icon. This icon provides a simpler one-click option. If the execution is paused for the TCER, the Resume icon is displayed. The TCER list view also appears in the Test Artifact dashboard viewlet, and this capability is available in that viewlet. You can now select and run multiple test case execution records from a table view. When you run multiple test case execution records, a dialog box opens where you select test cell, build record, and schedule execution options, and see the number of tests selected for execution. When you click Finish, the selected records are placed in an execution queue and you can access them in the execution console. You can select and run multiple test case execution records for all types of tests such as manual tests, automated tests, or tests without scripts. The status of the adapter task is shown as in progress when the adapter takes the task for execution. Previously, the time was not shown when the adapter picked the task. Now, the test start time is displayed both on the execution page as well as in the execution console. The start time for test suite execution is the earliest start time of its associated test cases. When a test suite runs in sequential mode, the start time of the test suite is the start time of the first test case of the test suite. When a test suite runs in parallel mode, test cases can run in any order based on the availability of the adapter. The start time of the test case that starts running first is the start time of the test suite execution. The start time of the test suite execution is displayed in the suite execution console, which also displays the test start time of each test case. In the Run Test Case dialog box, existing test case execution records are now shown in a table view on the Use an Existing Test Case Execution Record tab. You can sort or filter the table to select which test case execution records to run. You can create a new test case execution record by using the Generate a New Test Case Execution Record tab. OSLC asynchronous migration is a background process that runs after an upgraded Quality Management (QM) server is started. The migration manages migrators, which run a set of tasks on specific artifact types that require migration and publishes patch events in the Tracked Resource Set 2 (TRS2) feed that contains the changes. The execution is asynchronous and does not prevent the server from working or users from performing normal activities while the migration is running. Some features might not be displayed in Jazz Reporting Service until the migration is finished. In the table, each row represents a project area. The status and total number of migrated items are displayed for each project area. In 6.0.5, the Copy link for this page action was introduced to copy the URL of the current page. This action was enhanced to copy the link as rich text for browsers that support it such as Google Chrome and Microsoft Internet Explorer. If you paste the copied rich text link in applications that support rich text, such as Microsoft Outlook and IBM Notes, the title of the page is displayed as a link, with the URL set as the HREF attribute of the link. An optional Description column was added to the browse test case table. To add this column, use the "Change column display settings" dialog box. The new column is also available during a CSV or PDF export of the browse test case table. To insert images in the rich-text editor, you can now drag and drop images from the local file system into the editor. The supported image file formats are BMP, GIF, JPEG, and PNG. The supported browsers are Mozilla Firefox, Microsoft Internet Explorer, Google Chrome, and Safari. To insert images into the rich-text editor, you can copy a full image or part of an image onto the clipboard and then paste it into the editor. The supported browsers are Mozilla Firefox and Google Chrome. A Filter icon was added to the header of the Test Artifact dashboard viewlet. The filter provides the same text search capability as the text search in Rational Quality Manager artifact list views. In artifact list views, a button is now available to open and close the left navigation pane. The navigation pane is organized into tabs, which makes selecting the Filter By panel easier. In the Project Properties window, the groupings of project properties are now organized and displayed as tabs. When you select a tab, the group's properties are displayed on the left, which streamlines the display and makes navigating to the group's properties easier.